Please read our Terms & Conditions carefully. By paying the reservation amount you indicate you abide to them. Click & Enjoy S.L. 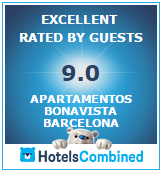 is the company in charge of managing Bonavista Apartments Barcelona, from now on “Bonavista Apartment Barcelona” or “BAB”. In order to fully confirm the booking, BAB requires, in all cases, a payment of 30% of the total amount of the stay. The payment with credit card or by wire transfer is the last step of the booking procedure, after which you will receive an email with the booking confirmation. If you pay wit credit card you will receive a confirmation automatically. This payment is made trough a secure server. If you pay by wire transfer, please send us a copy of the transfer receipt to info@bonavista-apartments.com. We will send a confirmation as soon as the transfer appears in our bank account. The pending 70% of your booking has to be paid upon arrival with credit card or in cash. Any cancellation or modification of the booking has to be notified in written by email or fax. BAB will not be liable for any misunderstandings caused by the non-communication in written, of any cancellation or modification, having the right to refuse all related claims by the customer. Any modifications of existing bookings will be regarded as new reservations therefore being subject to the Cancellation Policy. All cancellations, including force majeure, are subject to our Cancellation Policy. BAB recommends purchasing a travel cancellation insurance covering cancellation fees. Customers should inform us, at least 1 week before their arrival, about their expected arrival time. Please provide a contact telephone number, ideally a number you have with you during your journey. We request the client to be available in that number, or else please indicate that you will not will be available at all. Airplane: flight number, airline, airport of origin and landing time. Train: train number, arrival time and train station or arrival. Bus: arrival time, bus station of arrival and bus station of origin. Car: estimated arrival time and city of origin. We ask you to contact us once you have collected your luggage, or if you come by car, when you are 30 minutes or 30 km before you reach the city center of Barcelona. Our staff will not go to the apartments before we receive your call. On our website you will find helpful information on how to reach our apartments. Upon arrival, BAB reserves the right to request a security deposit of 150 EUR, in cash or with credit card pre-authorization. This amount will be fully refunded on departure if the House Rules have been observed. Check in time is between 15:00 and 20:00. In case you need to arrive earlier, we will try to accommodate to your needs. We have a locker where you can safely leave your belongings, and visit the city while we finish cleaning the apartment. In any case, we cannot guarantee that the apartment will be ready before 15:00. For arrivals after 20:00, there is an extra fee of 25 EUR. For arrivals after 24.00, there is an extra fee of 50 EUR. We remind you to send us your arrival time at least 1 week prior to your arrival. In order to set up the apartment for the following guests, the flat has to be vacated at 11:00 at the latest. We will try to accommodate to your needs. We offer our customers to safely deposit their luggage in one of our storage rooms until departure. We will ask you about your estimated check-out time on arrival. The price includes a final cleaning, which takes place after the departure, but it does not include daily cleanings. For stays of 7 days and longer, the price includes weekly cleanings with changing of towels and bed sheets. You can order additional cleanings and fresh towels and linen for a small amount. The client will inform BAB of the number of guests included in the booking. Unless agreed otherwise, only the number of persons indicated by the client when booking shall be authorized to use the apartment. In the event of any infringement of the aforementioned obligations, BAB, at its sole discretion, will be entitled to request the client to leave the apartment, and the client shall have no right to claim any type of compensation. Pets are only allowed if they have been explicitly accepted by BAB in written. Pet holders are responsible for all damages caused by their pets. We will apply an addition refundable security deposit of 150 EUR. We also ask for an additional cleaning fee of 25 EUR for an anti-allergen cleaning. Guests declare explicitly to use the apartment at their own risk and relieve BAB of all deduced claims of compensation. BAB is not responsible for any valuables brought by the guests to the apartments. It is the customer's responsibility to leave the apartment in good conditions. The guests are liable for any damages and impairments on the apartment, as far as they exceed signs of wear and tear on normal usage. In case of major damages, BAB will be authorized to deduct these damages from the security payment. If the damages are higher than the security payment BAB will be entitled to claim for a compensation of damages. The client signing these Terms & Conditions will be liable for the correct and decent behaviour of all the persons accompanying him/her. In case of irresponsible behaviour, parties or complaints from other guests, BAB shall be entitled to request the client and guests to leave the apartment immediately, regardless of the hour of the day, losing the rest of the nights reserved. In that case, the client shall not have the right to claim any type of compensation. In case of scheduled maintenance, we will inform you that someone of our staff will enter your apartment at an agreed time. Nevertheless, in case of emergency, BAB staff has the right to access the apartment immediately even if it has been impossible to previously inform the client. If you lose the keys or get them stolen, we will have to replace the lock. An 85 EUR fee will be deducted from the deposit. Do not leave the keys in the lock when you are inside the apartment. If you forget them there, you will block the lock, and we will have to call a locksmith. You will be charged with the full repair cost. If you forget the keys inside the apartment and we have to come open the door for you, we will deduct 30 EUR from your deposit. According to local legislation, we will request the name and passport number of all the guests. In compliance with article 5, section 1.a) of the Spanish Personal Data Protection Act 15/1999, we inform you that the personal data you transmitted to us will be inserted in a file, which has been notified to the Agency for Data Protection, and will be processed and used in order to fulfill the services you selected. Access to these data is limited to those employees and providers who need to know these data in order to guarantee the before mentioned services. In all cases, you have the right to access, object to, correct and erase the data as foreseen in the Law mentioned before. As a client we kindly ask you to have a look at the House Rules thoroughly in order to avoid any problems. Our main objective is for our clients to have a good experience in Barcelona. Please don't smoke in the apartment. Smoke on the terrace if there is one or outside the building, and please do not throw cigarette butts down into the street or patios. Please turn off the air-conditioning, lights and appliances if you leave the apartment, and do not operate the air-conditioning with the windows open; we try to be as environmentally friendly as possible. Although this is a safe neighbourhood, we always recommend you to lock the doors securely behind you and only take what you need with you for the day. You are expected to leave the apartment in a reasonable condition, specially the bathroom and kitchen. Please do not leave the garbage in the apartment. You can leave it in the garbage containers located outside on the street. Please ask us about recycling in Barcelona. Please note that the check out time is at 11:00 as we need to clean the apartment from 11:00 to 15:00 prior to the next check-in. We have a free luggage locker service available.